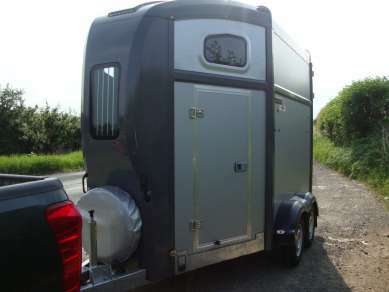 NEW NUGENT SPIRIT25 HBSP25 HORSE TRAILER, FRONT AND REAR UNLOAD TWIN AXLE DOUBLE HORSE TRAILER, SILVER WITH SPARE WHEEL WITH DURABLE COVER, CENTRE PARTITION, COBBLED GRIP RUBBER FLOOR MAT, KEY FOR THE LOCKING HEAD STOCK, Parabolic Leaf Springs, Galvanised Steel Chassis, Semi Automatic Hitch with Retractable Jockey Wheel, Centre Divider Partitions with Multiple Breast Bar Positions, Aluminium Floor Assembly, Lockable Grooms Door, Anti-slip Rubber on Front and Rear Ramp, Multidirectional Internal Air Vents with Roof Top Ventilator, Hinged Rear Vent Doors, Galvanised Front Window Guard, L.E.D. Interior Light (Switchable), Stainless Steel Hinges and Fasteners, High and Low Level Exterior L.E.D. Marker Lights.